where they live. On the other hand, several tropical species of flowering plant, such as the African baobab tree and the Australian ironwood, rely on fruitbats to pollinate them. Fruitbats also disperse plant seeds to new places and habitats. The other major group of bats, the Microchiroptera or microbats, is quite ecologically diverse. Many of these microbats feed on insects, using their echolocation ability to find flying or crawling insects and their superb flying skills to catch them. Insect-eating bats are supremely good at what they do: a single little brown bat can catch and eat 600 mosquitos in an hour. Thus, bats play an important role in regulating insect populations; in those places where bat populations have been severely reduced by human activity, the numbers of fruit flies and other pests have risen dramatically. Other microbats have adopted a diet of fruit, flowers, pollen, or nectar. Like their fruitbat cousins, these bats may occasionally damage crops or gardens, but on the whole play a beneficial role in transporting seeds and in pollinating several species of plants. Plants that are bat-pollinated include avocados, guava, mangoes, bananas, agave (from which tequila is made), and the giant saguaro cactus of the southwestern North American desert. Still other bat species feed on fish, frogs, lizards, small rodents, small birds, and even other bats. And while bats have an evil reputation for sucking blood, only three out of the thousand or so species of bat actually feed on blood. These vampire bats are found only in tropical Central America, and usually feed on livestock, although humans may also be unwitting "blood donors." They make a small, painless incision in the skin of a sleeping mammal and lap up the blood instead of sucking it. Bats may roost in trees or may inhabit caves, buildings, or any structure that provides an overhang. They are social animals, often roosting together in large swarms: one now-vanished colony of Mexican free-tailed bats (Tadarida brasiliensis mexicana), from the Carlsbad Caverns of New Mexico, was estimated to contain 9 million bats. Today, an estimated 1.5 million bats in the same species now live under the Congress Avenue Bridge in downtown Austin, Texas. In most species, females give birth to only one offspring per year. The young are usually born naked and helpless, with small and undeveloped wings, but grow rapidly and soon can fly and forage on their own. Those bats that live in places with cold winters can hibernate during the winter. Other bats migrate to warmer climates when winter comes. 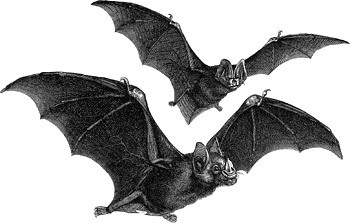 Bats are remarkably long-lived for their size; both fruitbats and microbats have been known to live for over 20 years. It should be clear by now that the reputation that bats have as evil, bloodthirsty, winged demons of the night is totally unjustified. Bats are not only elegant and fascinating creatures, they benefit humans by pollinating plants, dispersing seeds, and feeding on insect pests. Unfortunately, because of human misunderstanding, as well as practices such as habitat destruction and indiscriminate use of pesticides, many bat species are endangered, and some have already gone extinct. In the United States, nearly 40% of the native bat species are endangered. Bat Conservation International has much more information about bat ecology and conservation. Or check out Animal Bytes, presented by Sea World/Busch Gardens, for more fun bat facts. Grzimek, B. 1975. Grzimek's Animal Life Encyclopedia. Van Nostrand Reinhold Co., New York.